DJ, Producer, Parisian re-mixer, ex Resident Dj at theQueen club, FG Dj radio and ex-résident of L’Enfer. 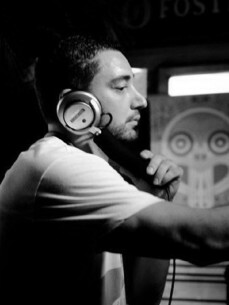 He played his first turntables when he was 13, and at the age of 19 was one of the youngest resident DJ’s in Paris. Since this time, influenced by the great DJs of the world, he worked non-stop to find his technique and style until he reached top international DJ-level. 20 years of experience mixing, beginning with 7 years of Hip-Hop. With the influence of the « Rave party » phenomenon and the new talent revealed by the electronic wave which swept through Paris, he gradually developed a techno sound. This opened up a new horizon and he was soon in his element. His flycases were gradually filled with records from Detroit, Chicago, Germany or England (Axis, Trax, Relief, Synwave, Trésor…). He played in a number of raves parties, making a name for himself and gaining public recognition. From then on his intention was to mix in a new creative way. From 1997, at the end of his sound ingeneer studies, onwards he worked in clubs, developing his style more progressively, House music being his choice of records. This was a revelation to him.At the time clubs preferred it to techno and Hip-Hop, this movement coming onto the scene as a melting pot of all cultures and musics. He handles this style magnificently, combining his teenage groove with funk, disco, jazz and even techno sound. At the time he mixed five days a week, on the turntables of the French capital’s biggest clubs. He refined his three-turntable-mix, which has become his means of expression.